I have included a few tips/reminders plus a brief discussion of coverage calculations which I hope may help make this a smooth process for you. 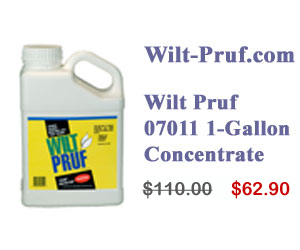 For Winter Protection the dilution rate is 1:5 yielding 6 gallons of application solution for each gallon of concentrate. Allow 2-3 hours for drying in daylight ( not necessarily sunlight) when temperatures are 32 deg. F or higher. 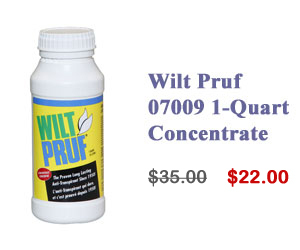 In the Winter months Wilt Pruf will remain on your shrubs for 3-4 months, it is best to spray later in the season to insure good protection for January and February. 5 gallon bucket yields 30 gallons of solution. 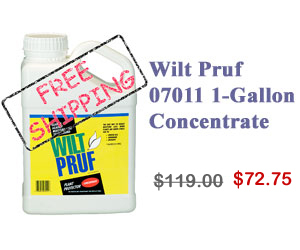 The best way to calculate coverage to determine the amount of solution needed is to test spray one shrub with water and then multiply the quantity used by the number of similar shrubs. 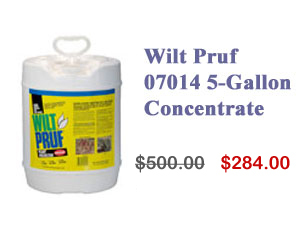 1/2 quart X 40= 20 quarts or 5 gallons of solution needed. From the table above I see that 1 gallon of concentrate yields 6 gallons of solution so it is probable that 1 gallon of concentrate would be adequate. If you need help with estimating your projects requirements, feel free to contact us at [email protected] or call us at 1-800-324-0705. We have a large stock of all sizes available. Our prices are unchanged from last year.